Arantxa Mendez and Ledishla Acevedo relax in their new dorm room at St. Thomas University in Miami Gardens. They recently arrived here from Puerto Rico, where Hurricane Maria closed their colleges. She went to a grocery store and saw an abundance of food and no lines of people competing for it. Again, she became emotional. “I started to cry because of everything that we had over here and they didn't have over there,” she said. Acevedo is one of dozens of displaced Puerto Rican students taking advantage of discounted tuition, room and board at public and private universities in South Florida. She’s now a freshman at St. Thomas University in Miami Gardens, which is offering free housing and food through the spring semester for students from Caribbean islands affected by the recent storms. And she’s not alone in feeling guilty about being here while her island languishes, many of its residents with no power and limited access to food and water. She still struggles with the decision to come here. But she believes her education is too important to delay. “Leaving was the hardest thing I had to do in my entire life. I was leaving my family, my friends, everyone that I love, and my island, knowing that they were basically going through a really, really rough patch. So it was hard. It was really, really hard,” Acevedo said, sitting in her dorm room at the small Catholic institution with her new roommate, also a Puerto Rican evacuee. “But I talked to my mom and my dad, and they basically told me, … ‘You need to leave. You need to think about what's best for you. You need to think about your future,’” she said. Acevedo is from Canóvanas, about 19 miles southeast of San Juan. This fall, she enrolled at the University of Puerto Rico’s campus in Carolina. But she attended only briefly before hurricanes Irma and Maria struck the U.S. territory in September. In the aftermath of the storms, many schools closed for weeks, and some still haven’t resumed classes. After arriving at St. Thomas University several days ago, she is already back in the classroom. The school has tested students to determine whether they could jump into classes that were already underway and also began a “mini” semester for them on Oct. 15. Arantxa Mendez and Ledishla Acevedo have grown close quickly as they deal with the difficult transition from Puerto Rico. Her roommate, Arantxa Mendez, 18, had begun studying nursing in February at the Interamerican University of Puerto Rico. She moved to Florida from Guaynabo, also near San Juan, after the storm because she has family in Miami and Orlando. Her parents, as well as Acevedo’s, are hoping to move here too. But they haven’t been able to find affordable flights, and applying for jobs here has been hard because of unreliable internet connections. Acevedo’s uncle lost everything in the storm — his house, his car, all of his belongings. She said the story is not uncommon. And even those whose belongings were spared are suffering acutely. Acevedo and Mendez just met, but it’s obvious how close they have become in a short time; they giggle together and finish each other’s sentences. They said the bond extends to the larger group of more than 60 students from Puerto Rico and the U.S. Virgin Islands who have enrolled since Hurricane Maria. Another student, senior Mario Nieves, said he feels like he’s part of a big family. “Maybe we don't know their names, but we feel like we have known each other for years,” said Nieves, 21, as the young women agreed. “We're in the same boat,” Acevedo said. Nieves had missed months of school even before the storm. He attended the University of Puerto Rico’s campus in Río Piedras, which had been shuttered last spring as students held a lengthy strike to protest budget cuts. So he felt an even greater urgency to get back to school. But he hesitated to leave, as well. The hurricane flooded his father’s hardware store, destroying merchandise and machinery. A couple of days before he left, his grandmother, who had been living without power and water, got sick and was rushed to the emergency room. Communications with his family have been spotty, but he was relieved recently to hear she was feeling better. Mario Nieves is now a senior at St. Thomas University. Even before Hurricane Maria hit Puerto Rico, he had already missed months of school because of a strike at his university there. He quietly listened to his peers describe their difficult transition, subtly wiping away tears. 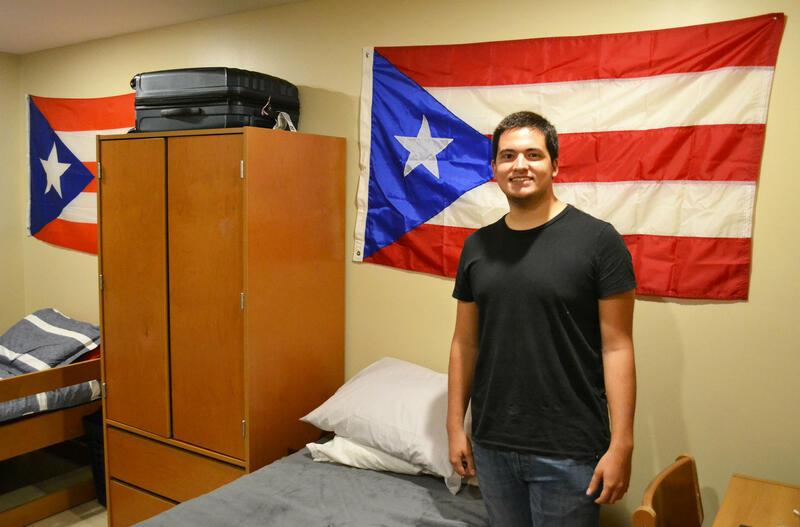 He insisted he show off the Puerto Rican flags that hang above his bed and his roommate’s in his new dorm. “I came with Puerto Rico. I have Puerto Rico inside of me, and that’s something that we Boricuas never change,” he said. It was the university’s provost, Irma Becerra, who suggested offering up the empty dorm rooms on campus to students coming from storm-ravaged islands. She was born in Cuba and grew up in Puerto Rico before eventually moving to South Florida. The president, Rev. Monsignor Franklyn Casale, said it’s consistent with the school’s Catholic mission to help people who are in need. The institution has housed and fed the students in addition to giving them free books for their classes. And, as of now, none has paid tuition, Casale said. He expects the school will collect tuition from the students next semester, after they have had a chance to work out snags with federal financial aid. The students said they’d love to stay but don’t know if they’ll be able to afford it. A year of tuition is nearly $29,000, and room and board costs hover around $5,000. Public colleges here are much cheaper, as are the schools they came from in Puerto Rico. But they’re told the university will try to help them secure scholarships. Casale said the school is “handling one problem at a time” and will address their financial concerns once they’re settled. He worries, though, that the island will experience brain drain. State schools are also working to accommodate new students from colleges that were closed by hurricanes. Gov. Rick Scott directed all public colleges and universities to extend in-state tuition rates to Puerto Ricans impacted by Maria. Many schools are advertising the discounts through the spring semester, and some are expanding the pool of eligible students to include those from other Caribbean islands. At Florida Atlantic University in Boca Raton, the tuition break applies to already enrolled students whose permanent addresses are in Puerto Rico. Administrators there said they hope to help students whose families might be experiencing financial troubles. 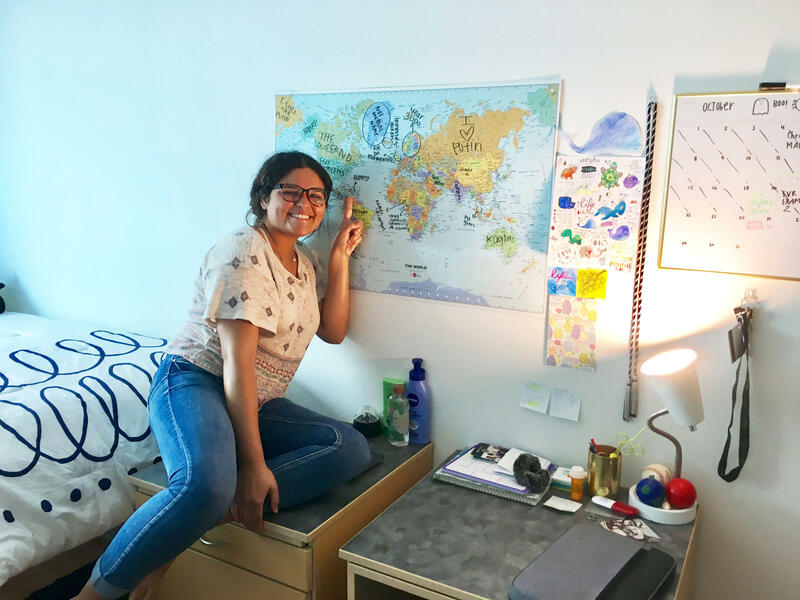 Florida Atlantic University student Ana Escobar points at Puerto Rico on a world map in her dorm room. She circled the island and wrote "home" with a heart. Ana Isabel Escobar, 19, is one of about a dozen students benefiting this semester. She’s technically a freshman, but it’s her second year in college; she transferred from the University of Puerto Rico at Mayagüez, which was also closed by the student strike. Now, she’ll qualify for the cheaper rates for her first year here, after which she'll establish Florida residency. In-state tuition for a year with a full-time course load is about $4,800. That’s more than $12,000 cheaper than out-of-state prices. When Hurricane Maria whipped through her hometown, Guaynabo, she was at the Palm Beach County school. After, she couldn't reach her parents for two days. That was especially tough because she's tight with her family, she said. Since she has been on her own for the first time, she has called her mom for help daily. When her parents heard she was going to be interviewed by WLRN, they asked her to videotape the conversation for them using her phone. There’s a circle around Puerto Rico, and the word “home” with a heart. She constantly feels the pull of the island and — like her peers — the guilt of being far away. But she hopes getting a college education — and eventually, going to graduate school — will allow her to contribute in a more profound way later.